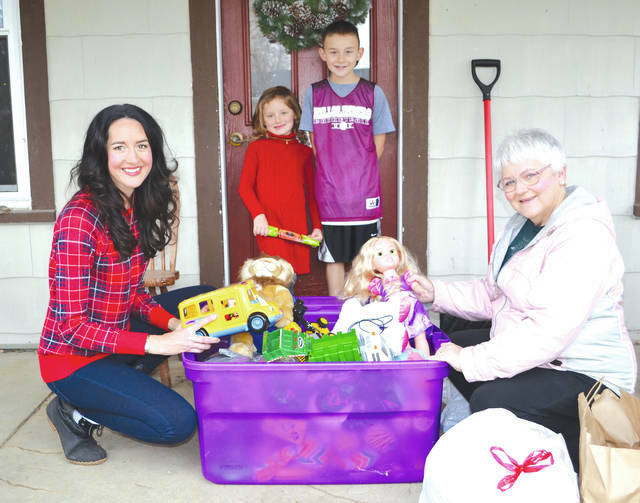 Toy Swap organizer Julie Yohey, left, and her children Vyla, 6, and Dexyn, 8, help frequent donor Jodi Kitchen unload a bucket of toys at their house for the event at Life-net Church on Dec. 4. Busy parents, grandparents and others looking for toys this Christmas season can swap their like-new toys for other like-new at the Christmas Toy Swap at 7 p.m. Dec. 4 at Life-net Church, 142 Dellinger Road, Urbana. Participants may drop off items at the church up until the event and then meet at the church to receive the same number of toys to take home. Donations are accepted. “This is the fifth year for the Toy Swap, and it’s really grown,” said Julie Yohey, Toy Swap organizer. “The first year I think there were a dozen mamas, and now there’s been consistently like 30 each year. It’s really cool. The event has toys for all ages. Among the first toys to go are typically tractors, trucks and dolls, and “shoppers” can make their selection in the order that they arrive. Children are not invited to the Dec. 4 event. Yohey said that the event goes quickly and is usually finished within an hour. They usually don’t have anything left over because anything sitting on the floor at the end is given away. Participants may deliver toys the day of the event or deliver them to the church prior to the event in boxes or bags labeled “Toy Swap.” For more information, contact Life-net at 937-652-1303.